So I think I mentioned a couple times in passing how I’m now listing jewelry on Chairish.com. Like the Rhodonite bangles in the above photo (the dark rose colored ones) and so I thought I’d tell you guys that I’m a terrible negotiator. Chairish has a “make an offer” option and, hypothetically, if anybody likes the things I’ve listed on there? Well, make me an offer. It’s not that I “can’t” refuse so much as I pretty much “don’t” refuse. I am so lucky my dating life is long over. Today’s bangles: Rhodonite bangles (coming soon to my Chairish.com listing, the last Hermes bangle from my dad, and two horn bangles. And yes, my two dogs are back there hiding from the BIG NAUGHTY DOG. I seem like a loser that stares at wordpress all day but I swear I was about to go out for the night and a weather advisory has now banished me from the streets so I take to the computer for entertainment! This post delivered! I’m checking out Chairish now. Haha! Yet here am I with the window open waiting on each ping. It’s better than facebook because at least here is a little brain effort. Do you get any kind of deal like if you refer me to sign up for the site/newsletter? Just checking before I sign up for their newsletter crappage. I don’t see any shop signed up in Buffalo but that’s one of the cool features. You can do a local pickup from a place in your city. Thank you for checking, Buffalo is always last ugh! GIVE ME ALL THE BANGLES!! Are you quite through with all the eating pizzas in your underpants then? Is that what I am to gather from this comment? I like the dogs hiding in the photo and wish you didn’t have to sell bangles your dad bought for you. I agree we cannot hold onto everything, but still I feel this sharing with others will earn you a lot of hugs from your Dad and he understands…. Oh no! I don’t sell the bangles my dad (or anyone) gave me. 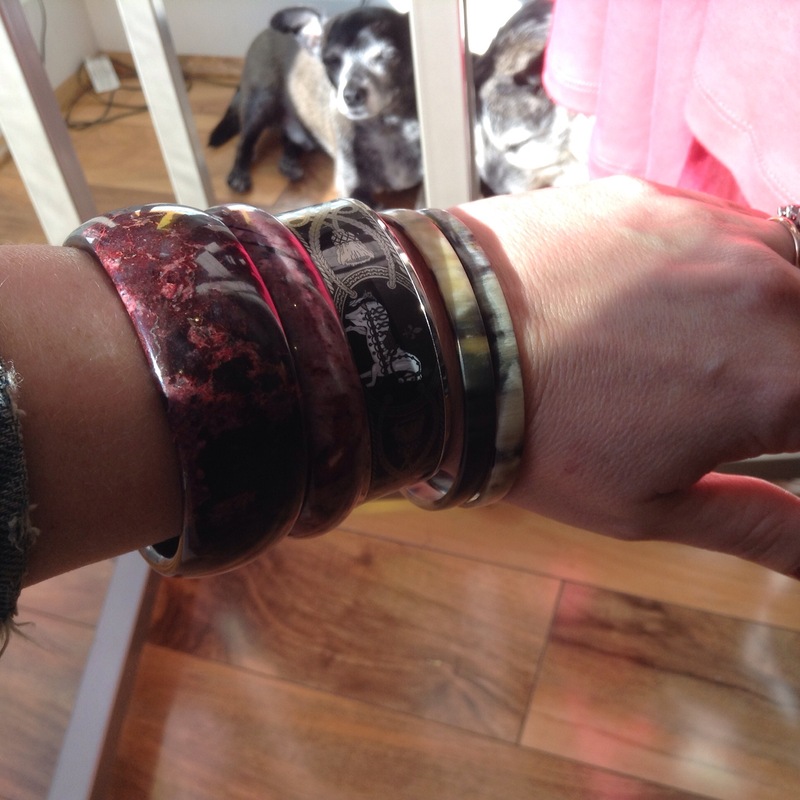 I buy bangles from vintage stores, wear them some, then sell them. So the rhodonite ones are from Goodwill. I would never part with something of his.